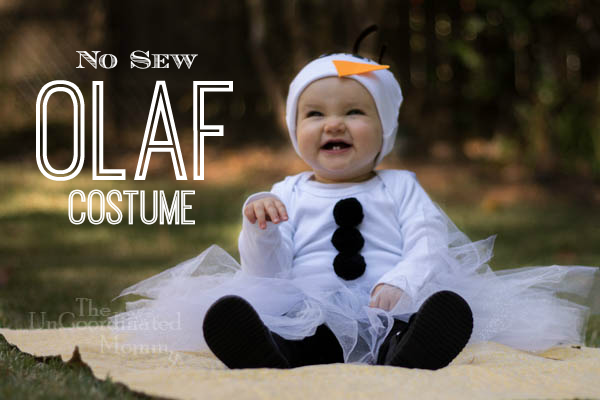 Are you looking for a cute costume idea for your baby for Halloween? 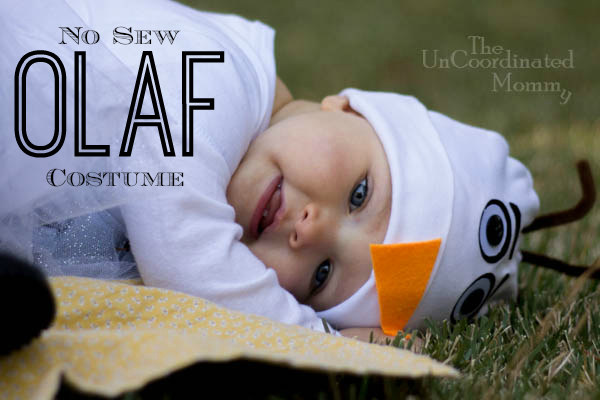 This adorable DIY infant Olaf costume is easy, no-sew, and low-cost to create! Insert the piece of cardboard into the onesie and glue the poms vertically. The cardboard will prevent the glue from seeping through the shirt and gluing it together. Make sure to separate the front of the shirt from the cardboard before it dries. Cut 2 large black circles and 2 eyebrows out of the black ribbon, two smaller circles out of the white grosgrain, and the carrot nose out of the orange grosgrain. Use the heat and bond to iron the circles to the hat. Either sew or glue the black buttons onto each eye. 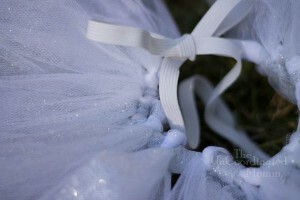 You can use felt instead of ribbon to save money. The carrot nose used here was made out of felt but it does not adhere well to the heat and bond so tacky glue will need to be used. The heat and bond is the strongest way to attach the pieces. Cut three TINY holes into the top of the hat. Thread the pipe cleaners through the top of the hat and twist to keep them in place. Make sure there are no pointy ends inside that hat that could stick the baby. 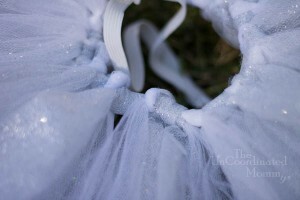 Cut equal amounts of white and glitter tulle into 16″ strips. Measure babies waist and add about 12″, cut this amount of elastic strip. 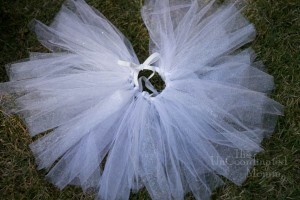 Take tulle strips and tie around the elastic. Make sure to alternate the white and glitter strips. Now just throw on some black pants and shoes and voila!! 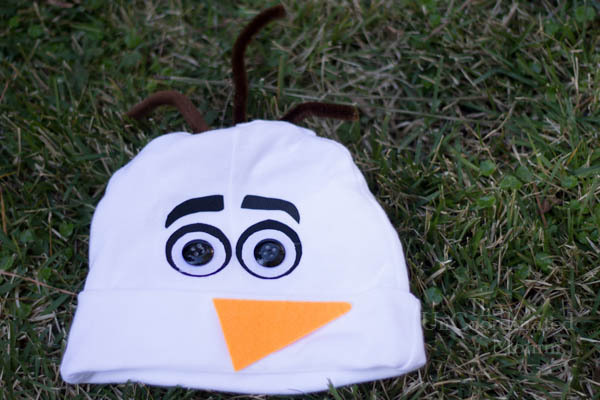 The cutest little Olaf you’ve ever seen!! This is my cousin’s little girl and she is so freakin’ adorable!! Of course, if you don’t have the time or inclination to make your own costume, you can always buy one! 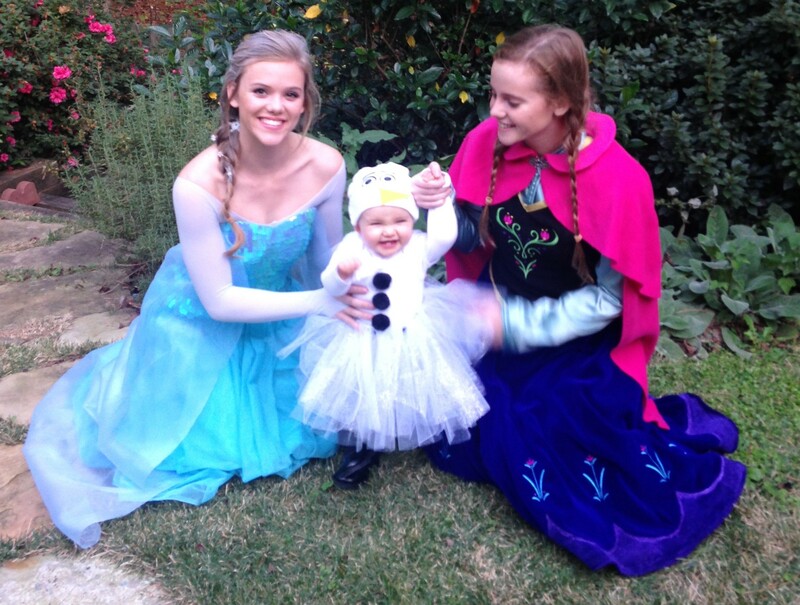 How are you planning on dressing your kids up for Halloween? Let us know in the comments! 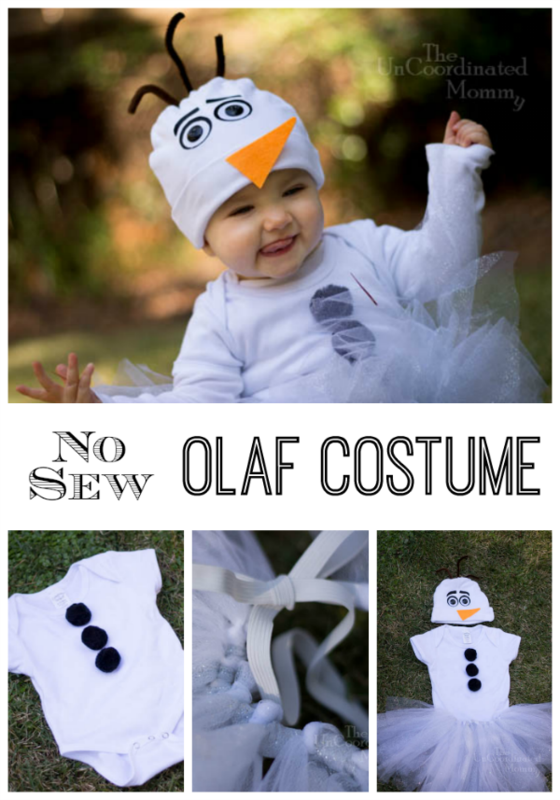 This is a super cute costume! I am pinned it to share!